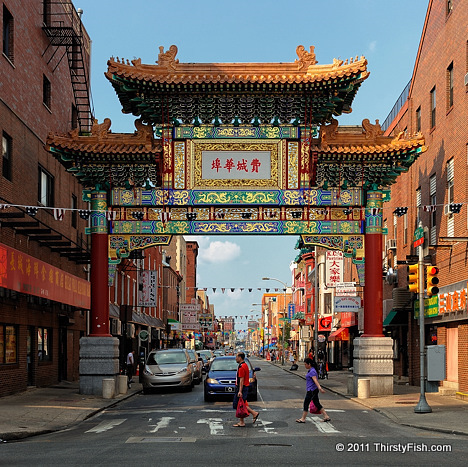 Located at 10th and Arch Street, the Philadelphia Chinatown Friendship Gate is a landmark and a symbol that was dedicated in 1984. It is the first authentic Chinese Gate built in America by artisans from China. Chinese architecture is characterized by bilateral symmetry, which signifies balance. In contrast, Chinese gardens, much like Japanese gardens tend to be asymmetrical to create a sense of enduring flow. Chinatowns are present throughout the world in places where ethnic Chinese people are found. Many are centers of commerce and tourism and have a large numbers of restaurants featuring East Asian cuisines. Cantonese, Fujianese, Northern, Sichuan, Taiwanese, as well as Burmese, Japanese, and Vietnamese cuisines can be found at the Philadelphia Chinatown.